This study for the state Delta Protection Commission compared the effectiveness of using new remotely sensed measurement technology to estimate farmers' "consumptive water use," or the amount of irrigation water crops transpire and evaporate from the nearby soil. Current methods of estimation and reporting of consumptive water use can be time-consuming and costly. The State Water Resources Control Board requires farmers to report the data for each water diversion every three years. Calculated estimates of evapotranspiration using remotely sensed measurements collected monthly from satellite. observations [(Derived from 2007 satellite data using the Surface Energy Balance Algorithm for Land (SEBAL)]. Compared the above estimates with those from two well-established crop coefficient methods [Cal Poly's Irrigation Training & Research Center (IRTC) spreadsheet approach and the California Department of Water Resources' Simulation of Evapotranspiration of Applied Water (Cal-SIMETAW)]. Examined eight crops grown in 2007 on five Delta islands: Ryer, Back Tract and the Lower, Middle and Upper Roberts. Provide accurate estimates of evapotranspiration that are less susceptible to human error. Are an efficient and consistent way to acquire data for estimation; no need to aggregate crop growth characteristics, irrigation practices and other field information. Offer a promising and practical alternative to crop coefficent methods of estimating evapotranspiration. 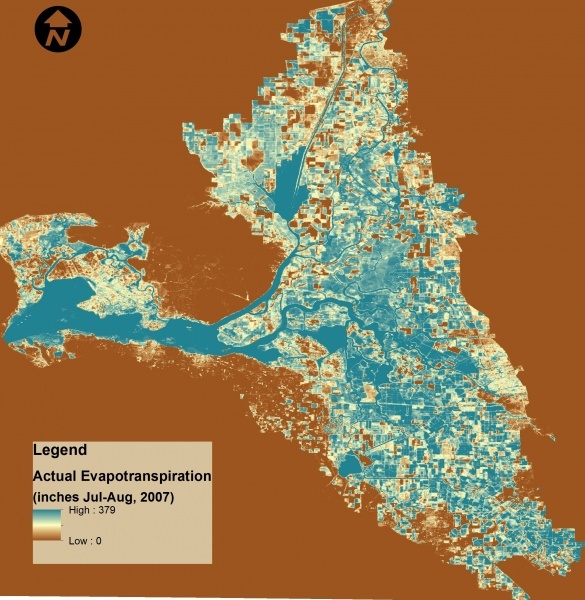 We encourage Delta farmers and water districts to collaborate on using remote sensing to reduce the time and cost of estimating and reporting consumptive water use. Medellín-Azuara, J., & Howitt R. (2013). Comparing Consumptive Agricultural Water Use in the Sacramento-San Joaquin Delta. 26 pages.